ProofHub quickies give you the option to write down your thoughts, ideas, tips and tricks quickly whenever you need and access them without wasting your time. Quickies in ProofHub save you a lot of time by working as the perfect place to jot down ideas, tips, quotes and more. Easy to access, these quickies come handy whenever you need to write something quickly. Add a quicky in ProofHub with just a single click to use it as your personal sticky notes. So, whenever you have to jot down something in quick time just add a new quicky and write it down in no time. Quickies in ProofHub come with easy to use filters that allow you to sort out information as per your preference. Just select a filter for the information you need to see and stay away from all the confusion. 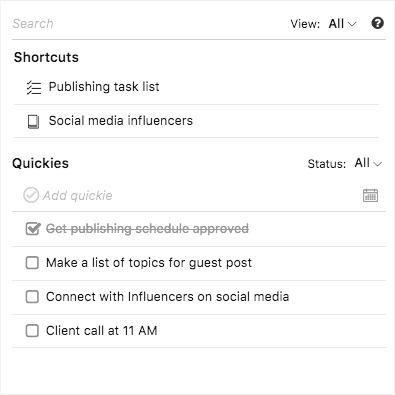 Quickies serve as your personal sticky notes, as well as a place where you can store shortcuts for important stuff like notes, task lists and discussion topics. So, now you don't have to jump from section to section to access them saving you a lot of your time. Always find yourself lost while accessing where you jotted down random thoughts and ideas? Quickies in ProofHub can be your savior.